The English publication Telegraph recently published an article by Ambrose Evans-Pritchard entitled “IMF paper warns of ‘savings tax’ and mass write-offs as West’s debt hits 200-year high”. “Much of the Western world will require defaults, a savings tax and higher inflation to clear the way for recovery as debt levels reach a 200-year high, according to a new report by the International Monetary Fund. Note the IMF’s use of the word “blow-ups”. The IMF implies that the conclusions and recommendations advanced in their “working paper” are ultimately based on IMF presumption that the “Western World” is on the verge of an economic “blow-up”. It means that creditors “voluntarily” agree to “take a haircut” and accept, say, only 30% of the money that’s due from borrowers. I.e., if a creditor loaned $1 million, his expected return will be “restructured” to take, say, $300,000 as payment in full rather than the $1 million that was originally promised to be repaid. Q: Why would anyone voluntarily agree to accept a 70% loss on a $1 million loan? A: Because, if they don’t agree to “restructure,” the government borrower will simply default on the entire $1 million debt. Recognizing that collecting $300,000 is better than collecting $0 thousand, the creditors “voluntarily agree” to “restructure” their loans so as to allow government borrowers to engage in overt theft and avoid admitting publicly that they’re bankrupt. • Insofar as the IMF admits that “the size of the problem” is “far beyond anything discussed in public to this point,” it appears that the size of the sovereign/national debt problem is much larger than almost anyone suspects. Thus, we have an “official” admission that the true magnitude of western governments’ national debt “problems” have been, so far, hidden from the world. For example, Obama tells us that the “official” national debt is $17 trillion. But other sources claim that debt is actually over $200 trillion. The IMF report implies that the true size of the US national debt is likely to be closer to $200 trillion than $17 trillion. • How will the American people and the world react when they learn the true size of their national debts? There’s a potential for panic in those reactions and possible financial catastrophe. So, it’s odd that the IMF would risk those dangers by releasing a report that admits the debt may be enormous. Nevertheless, the IMF implied that the true sizes of national debts for a number of nations can no longer be hidden and may be made public in the near future. These IMF admissions imply that a financial implosion affecting much of the Western World is at least inevitable, and may be imminent. “The paper said policy elites in the West are still clinging to the illusion that rich countries are different from poorer regions and can therefore chip away at their debts with a blend of austerity cuts, growth, and tinkering (‘forbearance’). Credibility = confidence = fiat dollar value. Insofar as our government is forced to engage in “gimmicks” to sustain the illusion of its own solvency, government will lose credibility, lose public confidence, and push the value of the fiat dollar lower (inflation) while the prices of goods, services, and commodities (like gold) go higher. The graph is misleading since it displays the average amount of debt of 22 advanced nations’ in relation to their GDPs. 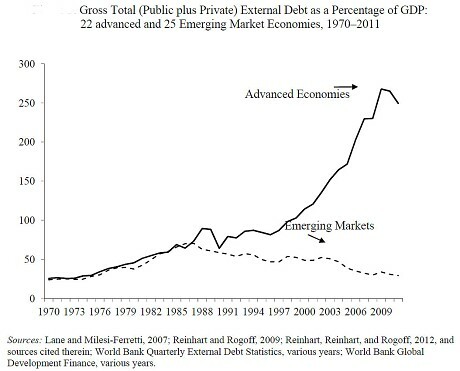 The graph implies that this average amount of debt is now about 250% of the 22 advanced nations’ GDP. The US is bundled into that group of 22 advanced market economies and is therefore individually invisible to the average reader. However, while the US annual GDP is about $16 trillion and President Obama claims that the total national debt is about $17 trillion, the Congressional Budget Office has admitted that, including unfunded liability, the National Debt is over $200 trillion. If we divide the official national debt of $17 trillion, by the $16 trillion annual GDP, the result is an official national-debt/GDP ratio of about 106%. We owe about 106% as much as we earn each year. That’s not good. It may not even be tolerable. But it’s not terrible. And it’s only about 40% of the 250% average national debt for all 22 “advanced markets”. So, compared to the other 21, we’re doing OK. But, if we divide the $200 trillion national debt calculated by the Congressional Budget Office by our $16 trillion annual GDP, we’ll see that the US is running a national-debt/GDP ratio of about 1,250%—and that is terrible, catastrophic, and unsustainable. There’s no way that more than 20% of the $200 trillion US national debt can be repaid. US creditors will eventually suffer an 80% “haircut”—probably a 90% “haircut”. As I’ve warned repeatedly for five years, What Can’t Be Paid, Won’t be Paid. If you folks listened and understood that warning, you did what you could to get your savings out of paper dollars and into something tangible. You avoided paper “promises to pay” and instead acquired actual “payments” in the form of land, guns, bullets, tools, gold or silver. And now, we have the IMF releasing a study that admits what I’ve told you for years. The national debt can’t be paid . . . so it won’t be paid . . . and, one way or another, government’s creditors will be robbed of much of their wealth. The debt problem won’t disappear or be eliminated by a national bout of positive thinking. While government can postpone the day of reckoning, while it does, the problem only gets worse. Postponing the inevitable to avoid some relatively small pain today, will only condemn us to suffer a more profound pain tomorrow. In other words, by “pooling” the debts of Greece with the debts of, say, Germany, Greek creditors can avoid the need to “restructure” their debts and “voluntarily” suffer massive losses on the assets they’d loaned to Greece. But, for Greek creditors to avoid taking a huge financial loss, German taxpayers will be forced to pay a significant tax increase. By means of “debt pooling” the original creditors will be saved, and the original debtors will be exempted from paying their debts—all by means of finding new “debtors”. I.e., the debt owed by the irresponsible Greeks will be foisted off onto the shoulders of the responsible Germans. The creditors won’t lose but the German taxpayers (who didn’t borrow the original currency or benefit from the original loan) will. But, no matter how you figure it, the massive national debts will cause somebody to lose big time. The debt can’t be paid. It won’t be paid. Someone must therefore suffer a huge loss. The main question is: Who has enough money to pay southern Europe’s debts who is also dumb enough to do so? The answer du jour is “northern Europe”. But will the industrious peoples of northern Europe agree to pay off the debts of the Greek, Italian, Spanish and possibly French party-animals? But even if Europe’s “northern taxpayers” consent to make good on southern Europe’s debt, they won’t (as the IMF writes) be “burdened” by “debt pooling”—they’ll be robbed. This robbery will be deemed a “burden” because the robbery will be sanctioned by governments of the northern (productive) countries and of the EU. “Debt mutualisation” is just another fancy term for “debt pooling”. They both mean sharing the debts—but not the assets, of course, and certainly not the profits. It means that financial entities that are “too big to fail” (like JPMorgan here in the US or Greece, Italy, Spain, etc. in Europe) will generously agree to share their debt obligations with the “northern countries” who are productive and therefore have some savings. In the end, “mutualisation” is merely another fancy word to conceal a massive theft and government bankruptcy. Who are these “savers”? They’re the people and nations who are industrious, productive and sufficiently responsible to have saved some of their earnings. Overly indebted western nations are now to be treated like primitive, child-like and irresponsible “emerging markets”—and rightfully so. They thought they were different. They thought they could play the fool and live forever on more and more credit. They thought they were “too big to fail” and therefore they’d never have to pay their debts. They were wrong. I know it’s hard to believe, but even the rich and powerful are subject to the same economic rules as the rest of us. Pay your debts or be declared bankrupt. • Like the industrious peoples of northern Europe, if you’re saving money in a bank account, the IMF proposes to tax your savings and force you to pay someone else’s debts. Q: Why impose a savings tax? A: In order to: 1) rob you; 2) give your savings to the irresponsible and thereby reward the non-productive; and 3) force you stop saving and start spending in order to stimulate the economy. 1. If the IMF is willing to advocate taxing savers today, you can reasonably suppose that your savings may be actually taxed within the next twelve to twenty-four months. “Most advanced states wrote off debt in the 1930s, though in different ways. First World War loans from the US were forgiven when the Hoover Moratorium expired in 1934, giving debt relief worth 24pc of GDP to France, 22pc to Britain and 19pc to Italy. Thus, 80 years ago, several western governments had gone so deeply into debt that they couldn’t pay, didn’t pay, and therefore wrote off debts equal to 16% to 24% of their national GDPs. By means of this theft, creditors were robbed and governments were empowered and enlarged. Governments have agreed to default on massive debts in the past. There’s no reason to suppose they won’t do it again. “Financial repression can take many forms, including capital controls, interest rate caps or the force-feeding of government debt to captive pension funds and insurance companies. Some of these methods are already in use but not yet on the scale seen in the late 1940s and early 1950s as countries resorted to every trick to tackle their war debts. “The policy is essentially a confiscation of savings, partly achieved by pushing up inflation while rigging the system to stop markets taking evasive action. The UK and the US ran negative real interest rates of -2pc to -4pc for several years after the Second World War. Real rates in Italy and Australia were -5pc. Despite government sophistry to the contrary, a fundamental truth remains: What can’t be paid, won’t be paid. Sooner or later, those of you who’ve loaned your wealth to the government in return for mere pieces of paper (promises to pay) are going to lose most of your assets. Those of you who’ve saved you wealth in the form of gold should at least preserve and will probably increase the value of your assets. President Barack Obama intends to nominate Stanley Fischer, a former head of the Bank of Israel, to be vice chairman of the Federal Reserve, replacing Janet Yellen, who is ascending to the central bank's chairmanship. Fischer, a dual citizen of the United States and Israel, is considered a leading expert on monetary policy. He was a long-time professor at the Massachusetts Institute of Technology. Departing Fed Chairman Ben Bernanke was one of his students. Obama also is nominating Lael Brainard as a Fed governor. Brainard served as the undersecretary for international affairs at Treasury during Obama's first term. She left the administration recently. He also is renominating Jerome Powell to the Fed for a second term. "These three distinguished individuals have the proven experience, judgment and deep knowledge of the financial system to serve at the Federal Reserve during this important time for our economy," Obama said in a statement. In selecting Fischer, Obama is tapping someone with extensive experience in global economics to serve on the Fed's seven-member board. Fischer served as chief economist at the World Bank and deputy managing director of the International Monetary Fund. He led the Bank of Israel from 2005 until 2013. During his time as the No. 2 official at the IMF from 1994 to 2001, Fischer dealt with a number of countries in financial crises. The 1997-98 Asian currency crisis forced a number of nations to seek support packages from the IMF to stabilize their currencies and emerge from deep recessions. "He is widely acknowledged as one of the world's leading and most experienced economic policy minds, and I'm grateful he has agreed to take on this new role, and I am confident that he and Janet Yellen will make a great team," Obama said. Obama praised Brainard as "one of my top and most trusted international economic advisers during a challenging time not just at home, but for our global economy as well." Economists said they did not expect Fischer, 70, to dissent from the activist approach to Fed policy that Bernanke and Yellen have supported. That effort has kept interest rates low in an effort to stimulate growth and fight high unemployment in the wake of the 2007-09 recession. Critics of this approach have worried that the central bank's low interest rate policies, including massive purchases of Treasury bonds and mortgage-backed securities, could be setting the stage for future economic problems. The concern is that the prolonged period of low interest rates could trigger unwanted inflation down the road and also threatens to build up bubbles in assets such as stock which could destabilize financial markets. David Jones, chief economist at DMJ Advisors and the author of several books on the Fed, said that Fischer had an excellent reputation in the field of monetary policy and would bring expertise in global economics. "The White House has reached out to someone who has a wealth of not only theoretical experience but practical experience in monetary policy," Jones said. In addition to serving as Bernanke's faculty adviser when he was writing his doctoral thesis at MIT, Fischer also taught Mario Draghi, the current head of the European Central Bank. He also wrote or co-authored a number of influential college economics textbooks. 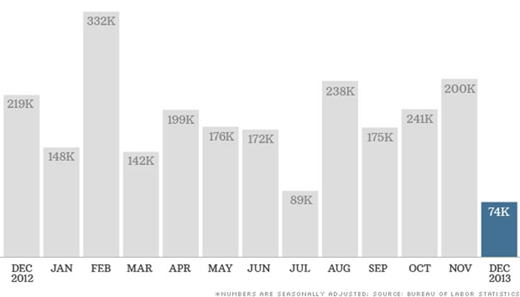 These numbers are not a fluke…..but a little reality creeping into the news. The only reason the rate fell below 7% is due to people giving up as they either accepted the handouts by government and believe this is as good as it gets for their future or just accepted there is no job for them. It seems we are standing in a huge and smelly political junkyard of scandals, distractions and egos. Our eyes desperately look around hoping to catch site of a hero, a real leader who loves God and country, not ego and power. Instead, we see mostly caricatures running around with sound bite theatre and amnesia about their past dealings. They develop fund raising fantasies and junkyard personalities who expect to win elections with us looking the other way. I’m sick of the smell frankly. I want to walk around in a beautiful park with a view of the Mountains and future not a smelly diseased junkyard full of political hacks. I think it is time to flatten a few rotten political cars but before we do that we must think long and hard if there isn’t something to be salvaged and saved. We must also decide which presented scandals matter and what is the response to those attacks by those wanting political power. Bombshells and assaults are already flying against anyone who might be a front-runner for the GOP in 2016 or for those conservatives daring to go after the Senate seats in 2014. Right now GOP hopeful Governor Chris Christie is trying to survive the George Washington bridge scandal where he is accused of shutting it down to enact revenge against a Democratic Mayor. To ad horror to this and the connecting emails that implicate his staff, a 91-year-old woman died on the bridge in part because the Paramedics couldn’t get to her at the scene. For Governor Christie, this is growing nightmare that may be a deathblow to his front-runner chances to run for President. So far he is saying he didn’t know anything about the bridge closing and was ‘mislead.’ He says he is outraged and deeply saddened. Maybe Christie didn’t know (as he says so far) but how do you know when politicians on both sides of the line punish and attack each other as a matter of course? They play the ‘plausible deniability’ card on a daily basis. “I didn’t know and I’m horrified.” “I will get to the bottom of this and investigate.” That is all we hear from Obama is ‘plausible deniability’ and ‘I didn’t know’ when he is standing in a putrid sea of scandals that have gotten so deep he almost needs a snorkel to breath air now. Look carefully at the facts regarding the ‘bombshell attack parade against any up and coming conservative’ because most the media will continue their junkyard lies and distortion against any conservative. However, we must also remember that some accusations and scandals might be true. What will the response be by those attacked? Will it be a lie to protect their supposed political ground or will they simply and humbly speak the truth whether it was a true accusation or false? Let us get this country out of the junkyard and vote in people of character who will actually serve ‘the people’ our Constitution and the truth. Join me each day on my show from 7-10pm PAC at www.therothshow.com. Does the human immune system go through growing or maturing stages as we age? Does the immune system need special attention as we age? What can we do to make our immune system as effective as possible and avoid compromising it? Let's take a look as what the immune system may need from the cradle to the retirement home. New research published in the Journal of Immunology claims to have discovered a new mechanism in the human immune system. They claim that the mechanism controls the white blood cells which are used to make antibodies against viruses, bacteria and other threatening agents. It has been suggested by science that our immune system becomes less effective or weaker as we age and they think that this new discovery has some connection to reversing the aging of the immune system. According to Professor Arne Akbar of the University of London, our immune system does not get stronger with each disease it fights but weaker. He says, "Our immune system gets progressively weaker as we age because each time we recover from an infection a proportion of our white blood cells become deactivated. As the proportion of inactive cells builds up over time our defenses become weakened." If science believes this then each time you are injected with disease, called a vaccination, the weaker they make your immune system. Professor Akbar goes onto say, "What this research shows is that some of these cells are being actively switched off in our bodies by a mechanism which hadn't been identified before as important in aging the immune system." So, modern medicine admits that they don't know everything about the human immune system yet they are injecting people with disease, which they now suspect is "switching off" some of your immune system efficiency. It appears by this new research that allopathic medicine has been prematurely aging our immune systems. Akbar also states that now they think that they may have a way to reactivate the immune system cells that were switched off thereby boosting your immune system; especially for the elderly. Instead of our immune system becoming more efficient with age it has been compromised to become weaker with age. Normally the immune system develops life-long immunity as it works to defend you from disease. According to science this immunity is passed on to us through DNA and in mother's breast milk. Now modern medicine questions if DNA has anything to do with the stability of our immune system. Is it possible that science is lumping in the lifespan coded in our DNA with how the immune system is supposed to work? The DNA strains have caps known as telomeres and they tend to get shorter as we get older and then deactivate. However, blood samples which have deactivated white blood cells in it also have long telomeres. Obviously, DNA lifespan coding does not shorten the effectiveness of the immune system. Medicine is assuming that since inactive white blood cells have long telomeres that these cells can be reactivated somehow. Don't they think that they are inactive for a reason? Scientists who switch cell biology on and off could be delving into dangerous ground. For if they can switch on your immune system they can certainly also attempt switch it off. As always it is all under the veil of helping the elderly with weak immunity and those with auto immune system disease, which are most likely caused by vaccinations to begin with. Harvard Medical School is beginning to delve into the area of nutrition and immune system. They are not willing to admit that lifestyle directly influences immune system function or that you have the ability to boost its function. For the moment they are intrigued by the notion that vitamins and herbs can help immunity and think more study is needed. They acknowledge that elements of diet, exercise, stress and other factors affecting immune system have been researched in animals and humans. They admit the results were interesting but in their opinion are considered preliminary. Their reasoning is that science is still discovering how the immune system works and they are not willing to accept nutrition, vitamins or herbs are capable of doing what they are incapable of explaining. To scientists boosting the immune system makes little sense scientifically and speculates it probably isn't a good thing. Remember they are looking at controlling certain functions of the body with toxic drugs, which is dangerous. The nutrition in whole foods and herbs is very different. Organic nutrition is balanced and supports normal function without suppressing or forcing the system like drugs do. So, when you boost your immune system with whole foods, vitamins or herbs you are actually bringing the function of your system up to normal and in affect reversing the damage from drugs and vaccines. The scientific community would have you think that you could not have any positive effect on your immune system. You'll hear things like, "The immune system is very sophisticated and makes many immune system cells. How would you know which immune system cells to activate for different microbes?" What nonsense. The immune system is sophisticated and it determines which immune cells to activate on its own. The nutrition is the building blocks the immune system needs to work efficiency. Your immune system white blood cells are created in the bone marrow. Many don't think that their blood is living tissue but it is. Just like your bones are continuously making blood cells, your immune system is always generating and activating the proper immune cells. The blood is made up of liquid and solids and the liquid part of our blood is called plasma and consists of water, salt and protein. More than half of your blood content is plasma. The solid part of the blood contains red blood cells, white blood cells and platelets. Every part of your blood has a specific job to do. The red blood cells must deliver oxygen from your lungs to all the living tissues and major organs. The white blood cells are your immunity defense and fight infections. The platelets help the blood to clot preventing hemorrhaging, loss of blood and blood pressure. The lifespan of your blood cells is short (red cells about 120 days, platelets only 6 days and white cells one day) and these cells are constantly replaced with new cells made in the bone marrow. How fast are these components for the blood being made by the bone marrow? Our bones are constantly manufacturing blood. Some components of our blood are replenished in just a few hours and others in a few weeks. In one case we have Professor Akbar tell us that spent white blood cells or inactive immune cells which accumulate and undermine our immune system. In another case we have the scientists at Harvard Medical School say, "What is known is that the body is continually generating immune cells. It produces many more lymphocytes (made of white blood cells) than it can use. The extra cells remove themselves through a natural process of cell death called apoptosis – some before they see any action. No one knows how many cells or what kinds of cells the immune system needs to function at its optimum level." The unneeded cells are removed from the body through its natural detoxification pathways (bowel and urinary). What some scientists are saying is although we can't prove that a healthy lifestyle, vitamins and herbs help the immune system and reduce the incidence of disease, we know that there remains a direct link which we can't prove but is likely. It is obvious that if the elderly have weaker immune systems it is because they are not getting the nutrition they need. Heck, the youth of America are not getting the nutrition they need and are projected to not live as long as their parents. Keep in mind that modern medicine gives the elderly (those over 65) a stronger flu vaccine. This means they are injected with more disease, more adjuvant, more mercury and antifreeze (typical ingredients in flu vaccines) than the average person. A direct delivery of disease via syringe is an artificial infection and is switching off their immune system to NOT manufacture antibodies with white blood cells. Science will also try to cloud the issue to discourage you from using immune boosting foods and herbs by saying, "Not everyone's immune system needs the same thing. What will work for one person won't for another," Again, we are not talking about substances that control but support a system. When there is more nutrition than the body needs it is able to void it out like the dead cells with no toxicity. Prescription drugs cannot claim this luxury. 1/11/14 Dr. Rebecca Carley with more info on dangerous allopathic medicine. Is Fukushima an ELE (Extinction Level Event)? After the earthquake on March 11, 2011, the 11 operating nuclear power reactors at Fukushima Daiichi all "tripped" as designed, and the nuclear fission process was stopped. "What is fission?" Good question. I'm glad you asked. Fission is a process by which an unstable atom breaks into smaller atoms, releasing energy as it does. What makes an atom unstable is the number of neutrons in its nucleus. In nature, elements show up with a different count of neutrons – these are called "isotopes" of the element. For example, a nucleus made of one proton is hydrogen, but when it has a proton and a neutron, then it's called "deuterium" (an isotope of hydrogen). When it has two neutrons and a proton, it's called "tritium" (another isotope of hydrogen). But even after the fission process was stopped, the fuel in the reactors continued to produce considerable amounts of heat, thus the main goal after the reactors tripped was to keep water circulating over the fuel rods to keep them cool and prevent damage. The reactor at Fukushima was surrounded by a concrete outer building designed to keep fissile material (capable of sustaining a chain reaction of nuclear fission) isolated from the outside world. The earthquake resulted in loss of power, thus the pumps didn't work, and the water couldn't be pumped. But the back-up generators kicked in and all was well. At least until the tsunami hit and knocked out all the back-up generators. At Fukushima Daiichi, all of the reactors (except Reactors #1, #2, #3, and #4) were brought into "cold shutdown" with water circulating as required. But these were the oldest reactors, and the loss of power to the pumps led to water in the pressure vessel boiling and the fuel heating up immensely, bursting the zirconium alloy cans that contain the fuel pellets. On March 12, 2011, the concrete outer buildings of Reactor #1 exploded. Then on March 14, 2011, the same thing happened at Reactor #3. A few days later, a crack was detected in Reactor #2. And today, almost three years later, Reactor #4 is teetering on the edge of collapse. Seismicity standards rate the building at a zero, which means that even a minor earthquake could send it into a heap of rubble. And sitting at the top of the building (in a pool that is cracked, leaking, and hazardous even without an earthquake) are 1,535 fuel rods, some of them full of "fresh fuel" that was ready to go into the reactor when the earthquake and tsunami hit. Dr. Arnie Gundersen (a nuclear engineer who used to build spent fuel pools) explains that there is no protection surrounding the radioactive fuel in the pools. He warns that if the fuel pools at Reactor #4 collapse due to an earthquake or other event, people should get out of Japan, and residents of the West Coast of America and Canada should shut all of their windows and "stay inside for a while." According to Reuters, the combined amount of cesium-137 contained in the 1,535 nuclear fuel rods still at Reactor #4 is 14,000 times greater than what was released when the USA dropped atomic bombs on Nagasaki and Hiroshima at the end of World War II. From day one, doctors in Japan helped perpetuate the Fukushima cover-up. Sick patients are not being told their illnesses are from exposure to radioactive contamination. Scientific reports showing radiation health damage to humans are forbidden to be published. Heck, the Fukushima Radiation Health Risk Advisor (aka "Propaganda Minister"), Dr. Shunichi Yamashita, has been promoting bizarre beliefs like "laughter will remove your radiation phobia." Yes, you read that correctly. The Japanese "expert" told the Japanese people that radiation would not affect "happy" people who laughed a lot! How absurd! Is he related to Tokyo Rose? Hey, maybe they should also follow after tiny leprechauns riding unicorns that can lead them to a huge pot of gold at the end of a magic rainbow! Or maybe they should sprinkle magic pixie dust over their beds at night to protect from radiation. Seriously, is the Fukushima disaster the equivalent of an "open air Auschwitz"? Is it a potential extinction level event ("ELE")? Well, the fact of the matter is that globally, sperm counts are down, immune system diseases are escalating, mutations are occurring in all life forms. Yes, I believe the evidence supports the assertion that Fukushima Daiichi has the potential to be an ELE. You see, the Fukushima reactors used "dirty fuel," a combination of plutonium and uranium (aka "MOX" fuel), which means Japan is going to be a "dead zone" for centuries. With MOX fuel, one fuel rod has the potential to kill 2.89 BILLION people. And there are over 1,500 fuel rods in Reactor #4 alone! Do the math. That means that if Reactor #4 melts down and collapses, and the fuel rods are compromised, it would have the potential to kill over 4.3 TRILLION people! Last time I checked, there were only about 7 billion people on the entire earth. The bottom line is that if Reactor #4 collapses, we would face a massive ELE from the release of radiation. Yale Professor Charles Perrow is warning that if the cleanup of Fukushima is not handled with 100% precision that humanity could be threatened "for thousands of years." That is, if we aren't in one already. Nuke experts like Dr. Arnie Gundersen and Helen Caldicott are prepared to evacuate their families to the southern hemisphere if that happens. It is that serious. So now you know, if you didn't before. We are in big trouble. Let me reiterate. This isn't just about Japan. The cold, hard reality of the matter is that this is truly a disaster that is planetary in scope. Keep in mind that Tokyo beat Madrid and Istanbul to host the 2020 Olympics. I'm not a betting man, but if I were, I'd bet that by 2020, Tokyo is uninhabitable. The Olympics will not be held in Tokyo. Former UN advisor, Akio Matsumura, was told that if the fuel pool at Reactor #4 collapses or the water spills out, so much radiation will spew out for 50 years that no one will be able to approach Fukushima. Even more dramatically, Matsumura writes: "It is no exaggeration to say that the fate of Japan and the whole world depends on Number 4 reactor." Ambassador Murata also informed the world that the total numbers of the spent fuel rods at the Fukushima Daiichi site is in excess of 11,000. This number is confirmed by US Department of Energy data. The jet stream, and a highly dynamic portion of our atmosphere called the troposphere, have been swirling around massive amounts of radioactive particles and settling them out, mostly in rain, over the entire northern hemisphere, especially the west coast of North America, from Alaska down to Baja and even further. Please do your own research, keeping in mind that the nuclear "propaganda machine" is well armed and funded, and the global internet is being systematically "sanitized" of truthful information about the Fukushima global disaster and subsequent cover-up. Are you breathing the air? What about the radioactive nuclides in your drinking water? And in the fish you are eating? Keep in mind that it's been happening every second of every day for the past (almost) three years. Are you beginning to understand the enormity of the problem? In the words of my good buddy, Liam Scheff: "I'd move to France if they didn't have more nuclear power there than anywhere in the world. I wonder if I can learn to speak Penguin? I understand Antarctica is nice, this time of year." Be sure to see next week's newsletter as I will provide some excellent suggestions for radiation remediation. ~ Ty Bollinger is the host of "Outside the Box Wednesdays" on the Robert Scott Bell Show. He is also author of the best-selling book, "Cancer-Step Outside the Box"and his latest book, "Monumental Myths of the Modern Medical Mafia and Mainstream Media and the Multitude of Lying Liars that Manufactured Them." So, the distraction of the "holidays" is over, where even the people who have educated themselves as to the reality of the hell we now live in get together with family and friends to pretend that we have something to be merry about. It is time to get back to doing something about what is going on; especially the ongoing genocide, rather than making excuses that it is "not that bad", we can adapt to the tyranny. As Obamacare kicks in, this is the time to face the music, and realize that it is time to stand up against the psychopaths destroying our world. If we don't, we are already dead.
" for several decades, since 1978, American hospitals and doctors have been under United Nations control through a system of codes for medical conditions called the ninth revision of the International Classification of Diseases, or ICD-9. In other words, all physicians must classify all diagnoses, treatments and outcomes by UN codes. There are currently over 14,000 codes from which doctors can choose to identify medical problems. Starting in October, 2014, under the new and improved tenth revision, or ICD-10, this list of codes will increase ten times, to over 140,000 UN codes. There will be eight or more codes to describe ways that someone was injured by a turkey, for example. Doctors will either enter a code on the computer or will not get paid. This is predicted to thin the ranks of doctors radically. Most of these highly intelligent people will find other ways to make a living. There will develop a huge doctor shortage and many people will suffer because of it. Obamacare, again, is presented as a "separate mandate" from the ICD coding system. In other words, they are supposedly separate systems of surveillance. In fact, the UN coding system will be the central framework of Obamacare. The tenth revision (ICD-10) has, like Obamacare, been delayed for several years and is now scheduled to become the law in October, 2014. What we in the American Defense Party want people to know is that by signing up for Obamacare they become wards of the United Nations with no recourse in the event of misdiagnosis or malpractice. Can we expect some sort of arbitration from the IRS? Please. These guys only deal in extortion – stealing our money with threats of violence and prison "